Herb used in salads and cooking. Mild anise or licorice flavour. 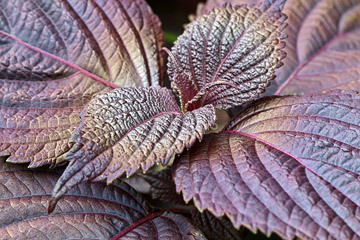 Called "shiso" in Japan and used in sushi, soups and noodle dishes, Chinese give it medicinal qualities. When cooked it is said to taste between mint and basil. In Korea it is called Perilla. Plants to 60cm. For best results, Perilla seeds should be cold stratified prior to sowing. To achieve this, mix the seeds with an equal quantity of moist sand and refrigerate (don't freeze) for a week.